Police have admitted having technical issues after releasing an e-fit of a burglary suspect which looks like a man wearing a lettuce. Officers released the image after a distraction burglary in which £60 was stolen from an elderly woman in Stockbridge, Hampshire. But the picture appeared to show the man with a lettuce on his head. 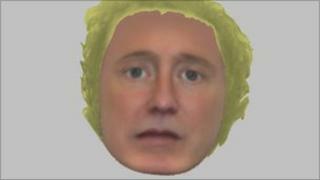 Police said they were waiting for a software upgrade to improve the quality of hair in future e-fits. A spokesperson said that "while the hair on this image may not be of the best quality, it takes nothing from the overall clarity of the facial features". He added: "It would therefore be wrong to withhold the release of the e-fit just based on this technical issue. "We would never release an e-fit a victim disagreed or was unhappy with and in this instance the victim fully supported the publication of this image." He is described as white, between 40 and 45, about 5ft 8ins, with a round clean shaven face, large round eyes and with wavy blonde or greying hair. A Victim Support spokesperson said: "Victims or witnesses to a crime quite rightly want and expect the criminal justice system to try and bring someone to justice. "People put their trust in the system and the software and expect results, which would explain why people might be baffled by the picture. "But it wouldn't be fair to criticise the force if what they have done is produced the best possible image from the facilities and description available to them."